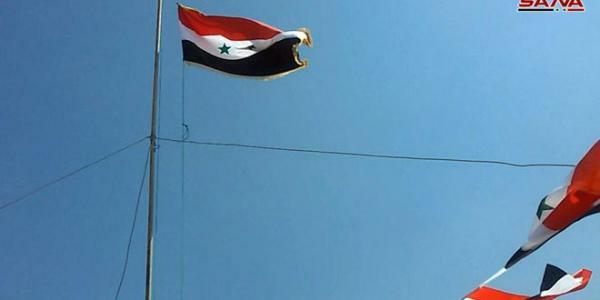 Units of the internal security forces entered Naseeb town in Daraa southeastern countryside and they hoisted the flag of the Syrian Arab Republic over the Municipal Council after ending the existence of terrorists in it paving the way for the return of the state institutions. SANA reporter in Daraa said that after securing Naseeb village by the army units and combing it to remove the car bombs, mines and remnants of the terrorist organizations, police units and security forces entered the town and hoisted the national flag over the Municipal Council amid huge masses of the town’s locals. The locals expressed comfort over the deployment of police units to consolidate the state of security and stability in the town after the exit of terrorists from it. They affirmed determination to intensify efforts in cooperation with the bodies concerned to restore the normal life to the town similar to the other villages and towns in the countryside of the province which have been liberated from terrorism.